The first thing we see in Robert Hillyer Barnett's feature debut is a movie camera, filmed head on as though it were filming us. The second thing we see, presumably in reverse shot as the true subject of that initial camera, is a woman (Kate Lyn Sheil), half-lost in shadow but visibly weeping - until the voice of a second woman is heard laughing off camera, and the woman in shot smiles, shakes her head and laughs too. If the first woman's tears are the titular Tears of God, they are also counterfeit - part of an actor's routine, performed for the (or at least a) camera. Before the title itself appears on screen, printed bright red in gothic font, the camera tracks through not just a wintry woodland, but also a dusty old movie theatre (which, it will turn out, is now serving as the church headquarters for a doomsday cult). In other words, whatever else it might be, Tears of God is a film very much concerned with its own status as a film, and with the mystic artifice of cinema itself, able to to capture otherwise forgotten or overlooked truths, and to preserve, even perhaps revive, the dead. Set in a vaguely defined dystopia where those who stray from the confines of the cult community and its protector priest (Samuel T. Herring) into the chaotic wilderness outside risk madness and murder, Tears of God is a strange, near impenetrable collection of (metaphorically and literally) dark imagery and disjointed scenes. 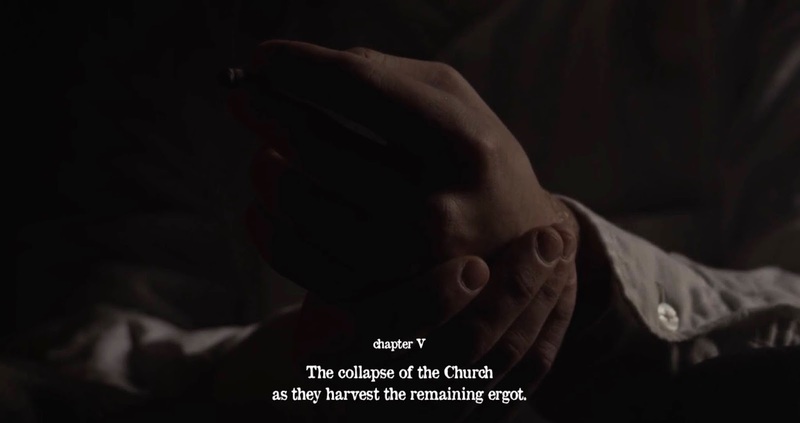 It was described in its Kickstarter campaign as "a horror film", and sure enough it is full of genre motifs: charred corpses, hanging women, shootings and stabbings, possession (including a visual reference to Andrzej Zulawski's Possession) and parricide, communion ceremonies reified as cannibalism, woodland witchery, even gratuitous scenes of disco dancing. Yet any attempt to make all this cohere into a lucid whole is bound to end in frustration and disappointment. The horror here derives not from conventional bogeymen nor from jumpscares, but rather from the uncanny unease generated by the film's own deep irrationality and dislocation. It is not that the film lacks for plot - on the contrary, there are clear narrative signposts laid out by the expository headings that punctuate sequences as though this were some kind of Victorian serial novel (e.g. "Chapter II Heather and Dorothy kill a man. A woman kills Father"). These simple descriptions are played out by the subsequent actions, but in a manner that is fragmented, abstract and allusive. 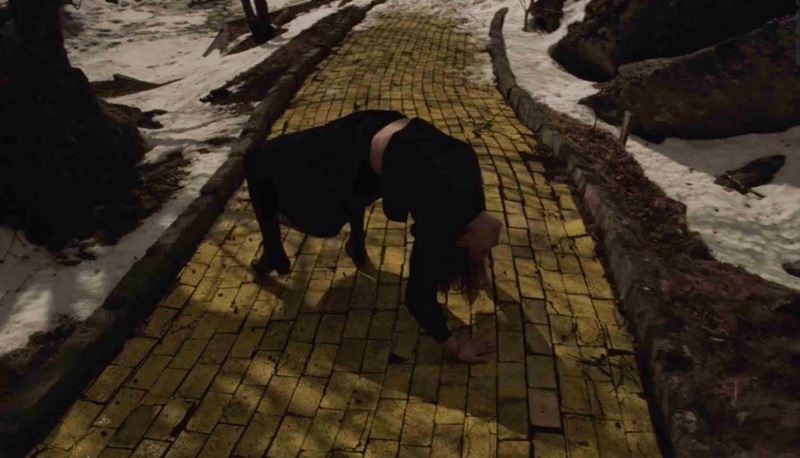 When in Chapter Three ("Dorothy rehearses for a film") we see the possessed Dorothy (Kira Pearson) pass a doorway clearly marked "OZ", and then crawl and writhe down a Yellow Brick Road before performing something like the spiderwalk notoriously cut from The Exorcist, it might not be clear exactly what is going on in this weird cinematic hall of mirrors, but we sure as hell know we're not in Kansas anymore. There is an unnerving ambiguity, introduced from the outset and maintained to the end, between characters and actors, between lived life and filmed fiction, and between reality, ergotic hallucination and apocalyptic dream - and this very elusiveness of both form and frame reveals to the viewer a disquieting, disorienting trip to self-de(con)struction. Sheil's weeping woman from the film's opening sequence is as close to a protagonist as Tears of God gets. Though she will, under instruction, rehearse many moods for the camera, the chief emotions that appear to propel her are grief and loss. In what is significantly the film's first spoken line, the woman's father (Michael Crabtree) asks, "Do you miss her?". Not only is this woman (designated 'the Daughter' in chapter headings) obviously in mourning for her mother, but she will soon also be working through her rueful feelings about the Father whom she has herself killed, and now wishes to bring back, even if for but a moment. "I am filled", the Daughter says, "with eternal sadness and regret", and so she turns to a "Phantom" filmmaker, whose medium, she hopes, comes with powers of resurrection. She is not unlike the heroine of Barnett's earlier short film Holy God, Holy Mighty, Holy Immortal, Have Mercy On Us (2013), who also resorted to ritual to exorcise the ghost of a dead father. What is new here is the strong metacinematic note, as the Daughter's quest for meaning amid the violent chaos of nature ends with her truly, if paradoxically, meeting her maker. The resulting film, reminiscent of the rural gothic of Josephine Decker's Thou Wast Mild and Lovely (2014) though somehow even more esoteric, ethereal and obscure, brims with moments of the unexpected and the awesome. Tears of God may be difficult to understand, but that very inscrutability is what lends the film its atmosphere of numinous dread. Missing it would be any adventurous viewer's loss. Tears of God. USA 2015. Directed by Robert Hillyer Barnett. Starring Kate Lyn Sheil, Samuel Herring, Michael Crabtree.